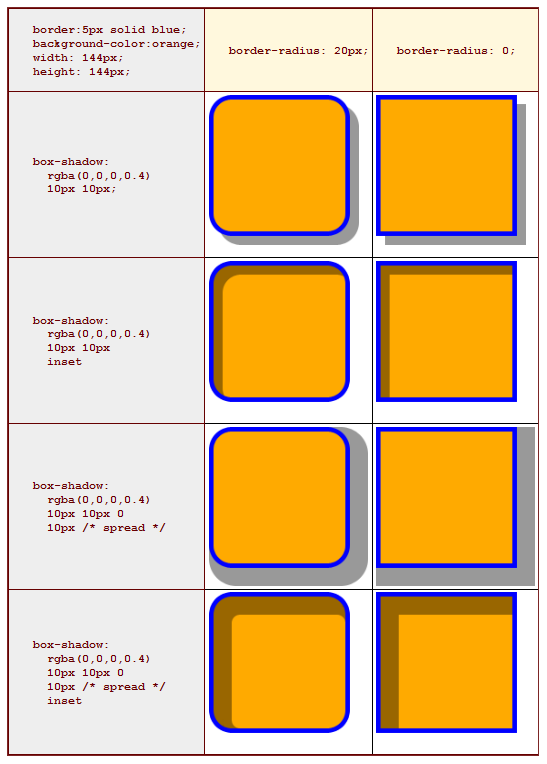 Last week also saw the release of an updated working draft of the CSS3 Template Layout module, read on for further details. The box-shadow property, which allows for the creation of drop shadows on box elements, was removed from the Backgrounds and Borders specification prior to it entering the Candidate Recommendation phase of development last December, as the working group felt that the property needed more work, however the property makes a reappearance in a recent editors draft of the specification (published on 5th May). The overall syntax and functionality remains the same as in previous versions, however the specification now offers further clarification with regard to the blur radius and spread radius functionality as follows. Why did the W3C in their infinite combined wisdom decide that in order to have rounded corners on a container, that container had to have a border with a width greater than 0. Infuriatingly stupid. Like nobody in the history of the internet will ever want a background image in a container with rounded corners that DOESN’T have a border. I completely agree with Jeffrey Gilbert, and I’m glad all the current implementations don’t respect the “If either length is zero, the corner is square, not rounded” clause. This needs to change. Also, I’d like to see the outline respect border-radius. -moz-outline-radius was a good try, but having the outline and border follow separate radii is cumbersome. Agreed on both of the above points: (1) I’m VERY glad to see progress, and (2) At the same time, rounded corners ≠ borders with a width! Is there a place where We The People™ who are eagerly watching CSS3’s development can voice our objections to the the appropriate Working Group? This clause in the spec relates to the border-radius values, not the border-width values. There is nothing in the draft that says in order to have rounded corners you must also have a border. That would be silly, and I really don’t see how anyone could possibly interpret the language of the draft that way, unless you are intentionally trying to get it wrong in order to goad others. The widths in the passage you quoted refer to the radius lengths of the ellipse (one horizontal, one vertical, or just write one length for a perfect quarter circle). An ellipse described with large radius lengths create large rounding of the corners, small radii create small rounding of the corners, and zero lengths create no rounding (sharp corners). It is very clearly worded in that regard. Border width is not mentioned at all there. Absolutely. There is a public mailing list for discussing the CSS specifications: “[email protected]”. It is mentioned, along with a link on how to join, in the first few paragraphs of that editors draft you wish to object to (here: ). I believe this to be incorrect as has been mentioned here, the spec details the border radius property but does not expect elements this applies to, to have a border defined. Images for example can be rounded in many browser implementations without borders. The term probably is just to avoid calling it ’roundedness’ like in fireworks for example! and find out that the ‘inset’ is a very nice addition to box-shadow. I think it makes more sense if that box-shadow was more like a gradient … between 2 colors specified or one and transparency. @Ahmad, but it is. SelectedColor–Transparency gradient. Because that’s what the shadow is. If you want a background gradient there’s a -moz-transform for that. And the thing I would like to see is a border which can be a gradient. That would be awesome. To be honest, checking the updates against previous versions, they became completely unreadable to me. The former definitions were clear, understandable and concise, I didn’t even try to finish the new definitions. I’m sure these new definitions are more complete and somewhat useful to implementors, but completely obsolete for most front-end developers. @Neils So the exact changes are here: http://dev.w3.org/cvsweb/csswg/css3-background/Overview.src.html.diff?r1=1.224&r2=1.225&f=h The text that was there before hasn’t changed, it’s just been expanded. Do you have any specific suggestions for making it easier to understand? I just tried out box-shadow property on a live site. It works nice. However, the term box shadow is somewhat misleading. In order to have a very soft ‘shadow’ over a bright background, it is required that the color value is high (towards the #ffffff). I have this applied on rotating background images. When the background image is bright, the ‘shadow’ appears fine. But when the background is dark, the ‘shadow’ is actually a glow. This isn’t normal behavior for a shadow and in this particular case, is undesirable. An opacity parameter would make this much more flexible, but the term ‘shadow’ would still not be precise. Then again, box-glow wouldn’t be any better. Primat: use rgba() to set the colour of the shadow, that’ll give you control over the opacity. I think what Primat is asking for is a way to have box-shadows use a blending model that actually approximates shadows so that they are _always_ darker than the background, i.e. using lerp(a, shadowcolour*backgroundcolour, backgroundcolour) instead of lerp(a, shadowcolour, backgroundcolour). Personally, I’m ok with the way blending works now (it’s good enough for most situations) but what I’d really like is to be able to specify a purely-vertical or purely-horizontal blur and spread. Curious, just mucking around with this. I notice that box-shadow inset only works correctly when a border is applied if a border-radius is used. Does not create the proper inset shadow. I wonder if this is something that they may change??? Just been mucking around with this as well, the shadow’s are showing up in safari, but not firefox, any idea’s why?